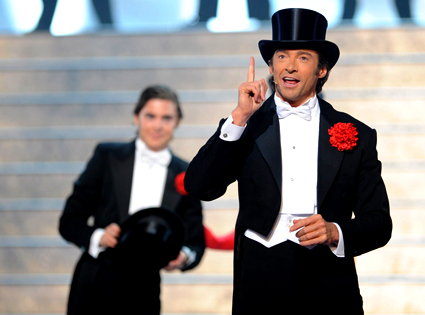 The following is a complete list of Academy Awards hosts and Oscar hosts throughout the years. You’ll no doubt see a number of recognizable names, as well as a few that remain a mystery. That’s why I’ve included a little information about each one, plus the years in which they served as host. With each subsequent Oscar ceremony, be sure to check back, as we’ll be updating the list. Douglas Fairbanks (1st) – Known as “The King of Hollywood,” Fairbanks was a founding member of The Motion Picture Academy and United Artists. He was also famous for a number of swashbuckling roles in silent films such as The Mark of Zorro and Robin Hood. William C. DeMille (1st,2nd) – The older brother of Cecil B. DeMille, he served as a director and screenwriter from the silent film era up until the ’30s. In 1929, he helped found the USC Film School. Lawrence Grant (4th) – An English actor who starred in The Mask of Fu Manchu, The Living Ghost, and Son of Frankenstein. Lionel Barrymore (5th) – Oscar-winning actor best remembered for his role as Mr. Potter in It’s a Wonderful Life. Will Rogers (6th) – A famed humorist and social commentator, Will Rogers wrote more than 4,000 newspaper articles and appeared in 71 films. At the time of his death, he was famous around the globe. Irvin S. Cobb (7th) – The author of more than 60 books and 300 short stories, Cobb was celebrated for his skills as a columnist and humorist. Frank Capra (8th) – The director responsible for such films as It Happened One Night, It’s a Wonderful Life, Mr. Deeds Goes to Town, and Arsenic and Old Lace. Bob Burns (10th) – A comic who enjoyed popularity on radio and film during the ’30s and ’40s. Bob Hope (12th,13th,15th,17th,18th,25th,27th,30th,31st,32nd,33rd,34th,37th,38th,39th,40th,47th,50th) – Performer on radio, television, movies, Broadway, and vaudeville. Also well known for hosting or appearing in 199 USO shows for American troops. Since he hosted the ceremony a record 18 times, it can be said that Bob Hope was the most popular of Academy Awards hosts and Oscar Hosts. Jack Benny (16th,19th) – Legendary actor, comic, and radio performer. From the ’30s to the ’60s, his radio and television programs were popular with American audiences. John Cromwell (17th) – The father of actor James Cromwell, he was an award-winning actor, director, and producer. James Stewart (18th,30th) – Stage and film actor who enjoyed great success during his seven decades in Hollywood. Received five Oscar nominations and one win (The Philadelphia Story). 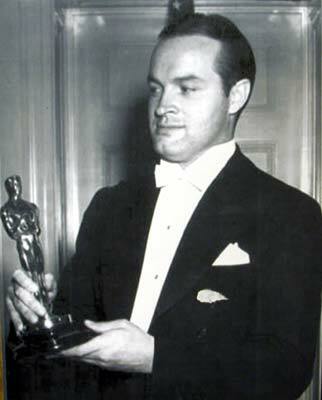 Robert Montgomery (21st) – Actor and director who was nominated for two Oscars (Night Must Fall, Here Comes Mr. Jordan). Father of Elizabeth Montgomery (Bewitched). Paul Douglas (22nd) – American actor famous for his roles in It Happens Every Spring, Angels in the Outfield, and Panic in the Streets. Fred Astaire (23rd) – Named the fifth greatest film star of all time by the American Film Institute, Astaire’s career lasted for 76 years and included 10 pairings with Ginger Rogers. Danny Kaye (24th) – Actor, comic, and singer who appeared in movies such as The Court Jester and The Secret Life of Walter Mitty. Donald O’Connor (26th) – Actor, dancer, and singer best known for his role opposite Gene Kelly in Singin’ in the Rain. Fredric March (26th) – Stage and film actor who won Best Actor Oscars for his roles in The Best Years of Our Lives and Dr. Jekyll and Mr. Hyde. Thelma Ritter (27th) – Popular character actress who was nominated six times for the Best Supporting Actress Oscar. Jerry Lewis (28th,29th,31st) – Writer, actor, director, producer, and comic known for his slapstick humor, pairings with Dean Martin, and his longtime work with the Muscular Dystrophy Association. Claudette Colbert (28th) – Her acting career lasted more than 60 years, and she won a Best Actress Oscar for her part in It Happened One Night. Joseph L. Mankiewicz (28th) – Producer, director, and screenwriter known for Cleopatra, Guys and Dolls, and The Barefoot Contessa. Celeste Holm (29th) – Oscar-winning actress who appeared in such films as Gentleman’s Agreement, All About Eve, and The Tender Trap. David Niven (30th,31st,46th) – English novelist and actor known as The Phantom in The Pink Panther and Phileas Fogg in Around the World in 80 Days. Jack Lemmon (30th,36th,44th,57th) – The first actor to win Oscars for both Best Actor and Best Supporting Actor, his career lasted over 50 years. Well known for his on-screen pairings with Walter Matthau, the friends are buried next to one another. Considered one of the most popular actors among his peers. Rosalind Russell (30th) – A Golden Globe and Tony award winner, Russell is remembered for roles in His Girl Friday and Auntie Mame. Tony Randall (31st) – Producer, actor, director and comic best known for his role as Felix Unger on television’s The Odd Couple. Mort Sahl (31st) – Stand-up comic and film writer who also served as a joke writer for President Kennedy. Laurence Olivier (31st) – An English producer, director, and actor, Olivier is remembered as one of the great performers of the 20th century. Won the 1948 Best Actor Oscar for his role in Hamlet. Frank Sinatra (35th,47th) – Legendary singer known as “‘Ol Blue Eyes,” Sinatra was the leader of The Rat Pack and also a respected actor in such films as From Here to Eternity and The Manchurian Candidate. Helen Hayes (44th) – Known as “The First Lady of the American Theatre,” her career lasted nearly 70 years. She is one of a very select group to win an Oscar, Tony, Grammy, and Emmy. Alan King (44th) – Jewish comic and satirist known for achieving success as an author, actor, and producer. Early in his life, he won twenty straight fights as a professional boxer. Sammy Davis, Jr. (44th,47th) – A member of The Rat Pack, Davis was a successful dancer, actor, singer. Enjoyed major success as a performer on Broadway and in Las Vegas. Carol Burnett (45th) – Appeared on The Carol Burnett Show from 1967 until 1978. Also a successful dancer, singer, writer, and comic. Michael Caine (45th) – Oscar-winning actor who’s appeared in over 100 movies and been nominated for an Academy Award in every decade since the ’60s. Knighted in 2000 by Queen Elizabeth II. Charlton Heston (45th) – Oscar winner and former head of the National Rifle Association. Heston starred in a number of iconic roles, including Moses in The Ten Commandments, Judah Ben-Hur in Ben-Hur, and Colonel George Taylor in Planet of the Apes. Rock Hudson (45th) – Well-known romantic lead in movies throughout the ’60s and ’70s, especially when paired with actress Doris Day. His career lasted over four decades, and Hudson became one of the first Hollywood celebrities to die of complications from AIDS. John Huston (46th) – Famed American director and actor known for his work on The Maltese Falcon, Chinatown, and The Treasure of the Sierra Madre. The father of actress Anjelica Huston, he was nominated for a total of 15 Oscars during his lifetime. Burt Reynolds (46th) – Charismatic actor known for his roles in Smokey and the Bandit, The Cannonball Run, and The Longest Yard. Appeared in over 300 television episodes and 90 feature films. Diana Ross (46th) – An American singer and actress who’s sold more than 100 million records. Considered by Guinness Records to be the most successful female artist of all time. Shirley MacLaine (47th) – Oscar-winning actress, author, activist, and dancer. Sister of Warren Beatty. Famous for her views on reincarnation. Goldie Hawn (48th,59th) – An actress, director, and producer who first achieved fame on Rowan & Martin’s Laugh-In. Transitioned to a successful film career in the ’80s. Mother of Oliver and Kate Hudson, and long-time girlfriend of Kurt Russell. Gene Kelly (48th) – Considered one of the greatest male stars of all time, Kelly was a singer, actor, dancer, producer, director, and choreographer. Best remembered for his role in Singin’ in the Rain. Walter Matthau (48th,55th) – Famous for his pairings with Jack Lemmon, Matthau was an Oscar-winning actor who appeared in films such as The Odd Couple, The Fortune Cookie, and Grumpy Old Men. George Segal (48th) – Stage and screen actor who has appeared in films ranging from The Cable Guy to The Longest Day. A talented banjo player also known for his role on television’s Just Shoot Me. Robert Shaw (48th) – British stage and film actor known for his roles in Jaws, The Sting, and From Russia with Love. Warren Beatty (49th) – Oscar-winning actor, director, producer and screenwriter. Brother of Shirley MacLaine. Ellen Burstyn (49th) – A stage and screen actress who has appeared in such works as The Exorcist, The Last Picture Show, and Requiem for a Dream. Won the Academy Award for Best Actress for Alice Doesn’t Live Here Anymore. Jane Fonda (49th,58th) – Controversial for her visit to Hanoi during the Vietnam War, Fonda has been a writer, political activist, fitness guru, fashion model, and is also a two-time Oscar winner. She was married to billionaire Ted Turner from 1991 until 2001. Richard Pryor (49th,55th) – Considered one of the all-time greatest stand-up comics, Pryor also hosted a children’s show and starred in such popular comedies as Silver Streak and Stir Crazy. Remembered for his movie team-ups with Gene Wilder and his well-documented drug problems. 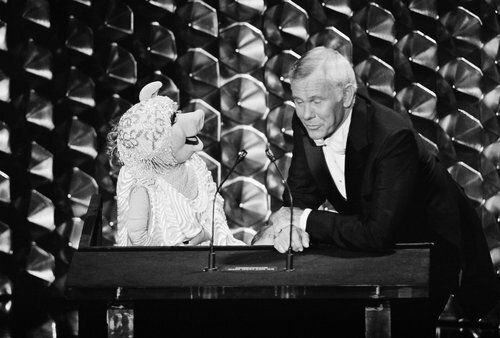 Johnny Carson (51st,52nd,53rd,54th,56th) – Considered the “King of Late Night,” Carson served as the beloved host of The Tonight Show for 30 years. Liza Minnelli (55th) – Singer, actress, and daughter of Judy Garland. She’s won the Oscar, Tony, Emmy, and Grammy awards. Dudley Moore (55th) – British comic, actor, musician and composer. Popular with women despite being 5’2″, Moore achieved fame in America with movie roles in 10 and Arthur. Alan Alda (58th) – Actor, director, and screenwriter best known as Hawkeye Pierce on television’s M*A*S*H. Active as an actor since 1958. Robin Williams (58th) – Manic stand-up performer who first gained fame on Mork and Mindy. He has won multiple Golden Globes and Grammys, and he received an Oscar for Best Supporting Actor in Good Will Hunting. Chevy Chase (59th,60th) – Comedian who achieved national fame as a cast member of Saturday Night Live. He transitioned to a successful film career by appearing in movies such as National Lampoon’s Vacation, Caddyshack, and Fletch. Paul Hogan (59th) – Australian actor and comedian best known for his role as Crocodile Dundee. He is also a Golden Globe winner. Billy Crystal (62nd,63rd,64th,65th,69th,70th,72nd,76th,84th) – A comic and former Saturday Night Live cast member, Crystal went on to achieve fame with movies such as City Slickers, Analyze This, and When Harry Met Sally. During his Oscar stint, he carried on a popular “feud” with actor Jack Palance. Whoopi Goldberg (66th,68th,71st,74th) – This comic-turned-actress is one of the few performers to win an Oscar, Grammy, Emmy and Tony award. David Letterman (67th) – A veteran of the late-night talk show circuit, Letterman followed in the footsteps of his idol, Johnny Carson. After being passed over as Carson’s replacement on The Tonight Show, he made the move to CBS. Steve Martin (73rd,75th,82nd) – Before he became a big-time movie star, Martin was a popular banjo-playing comic known for his novelty song “King Tut.” He has since earned Emmy, Grammy and American Comedy awards. Chris Rock (77th) – While he got his start as a stand-up comedian, Rock has also appeared in a string of films and hosted his own comedy show on HBO. Jon Stewart (78th,80th) – The host of The Daily Show on Comedy Central, this popular smartass also had his own late-night talk show. In a Time magazine poll, he has been rated as America’s most trusted news anchor. Ellen DeGeneres (79th) – One of the best-known openly gay Hollywood performers, Ellen has enjoyed success as an actress, talk show host, and stand-up comic. Alec Baldwin (82nd) – Star of numerous feature films and the television comedy 30 Rock. Formerly married to actress Kim Basinger. James Franco (83rd) – Popular actor who’s appeared in films ranging from Spider-Man to Pineapple Express. Anne Hathaway (83rd) – Got her start with youth-oriented films such as The Princess Diaries, but has since transitioned to more mature roles in Brokeback Mountain, The Devil Wears Prada, and Rachel Getting Married. No Host (11th, 14th,20th,41st,42nd,43rd,61st) – On seven different occasions, the Academy has chosen to go without a host for their Oscar ceremonies. This entry was posted on Thursday, May 24th, 2012 at 2:50 pm and is filed under Academy Awards. You can follow any responses to this entry through the RSS 2.0 feed. You can leave a response, or trackback from your own site. I loved this short article, it was very helpful. All the best! !